As opposed to liposuction performed to remove only unwanted fat from relatively skin-tight abdomens, tummies which demonstrate unwanted fat, stretched muscles and loose skin will require some form of an abdominoplasty, usually in conjunction with liposuction to achieve the best results. Liposuction alone does not tighten loose skin, but after removing the excess skin and fat by adominoplasty and after tightening the stretched muscles, liposuction can be added to "liposculpt" the final result. The recommendation for a "mini" abdominoplasty or a standard abdominoplasty is made based upon the amount and location of loose skin and muscle a patient possesses. If the primary problem area exists below the belly-button (umbilicus), in the form of a small amount of loose skin, the patient may be a candidate for a "mini" abdominoplasty. A "mini" abdominoplasty will result in tightening of loose muscles above the umbilicus and a shorter incision in the lower abdomen (a little longer than a C-section scar). Liposuction is then utilized to treat any unwanted fat in the remaining trunk areas, like the waist, which also must be relatively tight. If the patient has experienced stretching of the muscles and has loose skin in the upper and lower abdomen and waist areas, a more standard abdominoplasty must be performed. There are two main ways of performing standard abdominoplasty - the older method makes a straighter, longer incision in the lower abdomen, doesn't incorporate as much (if any) liposuction, and doesn't tighten the waist. This is the method most plastic surgery residents are taught to do in their training programs. 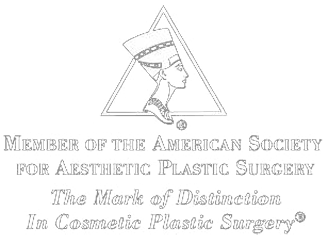 In the early 1990's, a newer method of abdominoplasty called the High Lateral Tension Abdominoplasty was introduced. Dr. Samuels pursued additional training to learn this technique and now uses it for most of her patient who require standard abdominoplasty. This incision is made low in the abdomen where a C-section scar is located, is a little longer than a C-section scar, but curves up toward the front hip bone to allow patients to wear higher "French-cut" bathing suit styles. More skin tightening is achieved in the front and waist areas of the tummy, and even in the upper thigh areas. Also, more liposuction is possible in the front and back of the waist than with the older method. The procedure is very popular in Dr. Samuels' practice, as she is one of the only surgeons in the area who offers this technique. High Lateral Tension Abdominoplasty makes body contouring of the entire trunk now possible in a single procedure. Abdominoplasty usually takes four to six hours, depending on the extent of work required. The additional time that it takes is due to the amount of sculpting that Dr. Samuels is able to perform with liposuction. The incision usually runs from hipbone to hipbone, and may be in a V-cut or U-cut shape so that you can hide the scar in a two piece bikini. The next incision in made around the umbilicus, freeing it from surrounding tissue, therefore, the umbilicus may have a "cats eye" appearance to it after surgery. Dr. Julene Samuels and her office staff will give you specific instructions regarding surgical preparation. This includes medications to avoid, eating and drinking, as well as smoking. If you smoke be prepared to quit 6 weeks prior to your surgery and not resume for at least 6 weeks after surgery. Medications to avoid include Aspirin, Advil, Aleve, Motrin, Ibuprofen, Naproxen, and any vitamins or herbs. Your surgery will be done on an inpatient basis under general anesthesia with the option to stay one or two nights at the hospital. You should arrange for someone to drive you home after surgery and to assist you in your immediate recovery period, which averages 10-14 days. Abdominoplasty may be performed at Jewish Hospital Downtown, Baptist Hospital East, Norton Suburban Hospital, or Alliant Medical Pavillion. For the first 10-14 days, your abdomen will be swollen and you will have minimal abdominal and back discomfort, which is easily controlled with pain medication. A pain pump is placed at the time of surgery, which delivers constant numbing medicine to the abdominal muscles, also helps to decrease abdominal discomfort. You will have two drains placed during surgery, one of which will be removed at 5-7 days post surgery, and the other will be removed at 10-14 days post surgery. You will be placed in a girdle for a period of two to six weeks after surgery once the drains are removed. This garment is very supportive and aids in back discomfort. We also recommend a brief period of Post-Operative Manual Lymphatic Drainage Massage once both drains have been removed. This is a technique that our massage therapist can teach to you or a family member. The technique aids in removing fluid from the body faster and rapidly decreasing swelling. It may take you weeks or months to feel like yourself again. Most people return to work after two weeks; however, this doesn't include jobs with large amounts of physical activity. Exercise may be performed after 4 weeks, but strenuous exercise needs to be postponed for six weeks. Your scars will take approximately one year to fade and flatten out. While they never completely disappear, they may be covered under most clothing, including underwear or a bathing suit.